The blizzard is over and the sun has come out. I bundle up and head outside, camera in hand. I explore around the farm and then strike out into the pasture, always on alert. I am looking for interesting snowdrifts. I love snowdrifts—always have. When I was still at home, after every snowstorm I would go wading through snow sometimes way over my boots in search of interesting snowdrifts to photograph. Sometimes I went alone, sometimes with Mom, sometimes with all of my siblings in tow (with a sled to pull the youngest when she got too tired to walk through the snow). Sometimes I found photograph-worthy drifts, sometimes not, all depending on the wind, but it was always a lot of fun. Sure, we got cold and wet and very, very tired from tramping through deep snow, but it never seemed to bother us. If there weren’t interesting snowdrifts, we still went sledding, so it was never a wasted effort. Our pastures were flat, but there was one long rolling hill that gave a decent ride if somebody gave the sled a hard enough push. And there was the lake. It had extremely steep banks, and during the summer we gave it a wide berth for fear they would crumble beneath our feet. But in winter, heavy snow and wind turned them into snow cliffs. We may not have had good sledding hills, but we had snow cliffs. And taking a sled down those almost-vertical slopes onto an icy, snow-covered lake was one wild ride! It was not for the faint of heart. I loved it then. I don’t think I’d dare do it now. When I left home, I moved to a state that didn’t have nearly as much wind, so I never saw “real” snowdrifts. And when I moved back to North Dakota, it was in a dry stretch, and most winters didn’t produce much snow. And when we did get a lot of snow, it wasn’t windy, so I just had a heavy blanket to shovel, no drifts to admire. This winter we’ve had both wind and a considerable amount of snow, and I am sure there are some fantastic drifts out there, but it’s been too bitterly cold to go tramping through the pastures to find them. The modest drifts around my yard haven’t been photograph-worthy, but I still kept pausing to admire them as I shoveled my driveway. 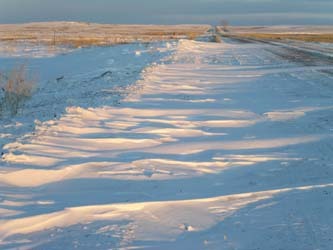 And not long ago when I was out driving I pulled over to take pictures of snowdrifts. They were only finger drifts across a gravel road, but the lighting was perfect and the play of light and shadow was fascinating. And I fell in love with snowdrifts all over again.